The Urwerk UR-111C Black Cobra is the first watch without wandering-hours that has been released by Urwerk. First released in two variants, including polished steel and gunmetal grey steel, the new Urwerk UR-111C Black Cobra is cloaked in a completely black case —in 316SL steel and grade 5 titanium, PVD coated in black— that makes the watch look as stealth and striking as it gets. Equipped with a roller and a case construction out of a Sci-fi movie, the UR-111C Black Cobra features a non-conventional way of setting the time and winding the watch. Prominent red, yellow and green indications present time through the use of an anodized aluminum cylinder and LIGA-processed nickel second wheels in a what is a jumping hours, linear retrograde minutes and digital seconds timepiece. 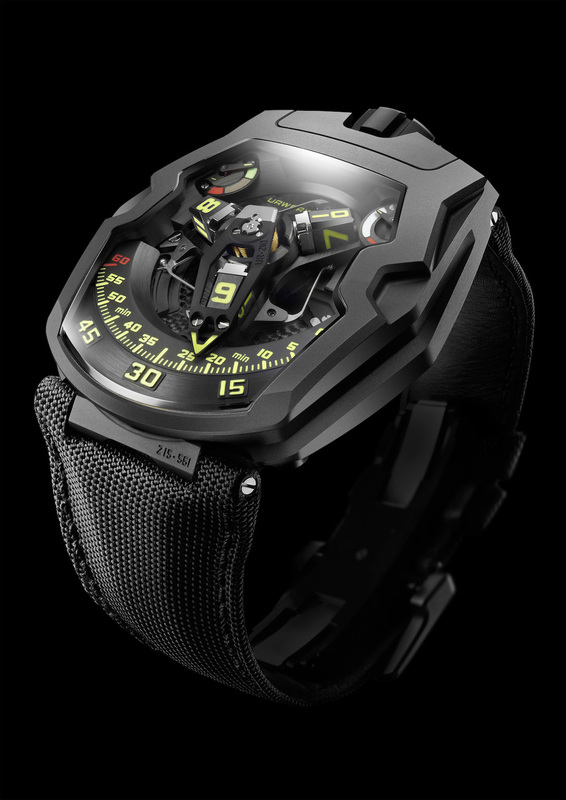 Posted on April 17, 2019 by Editor & Publisher and filed under Urwerk and tagged Urwerk UR-111C Black Cobra Urwerk Independent Brands Jumping Hours Watches 2019 Independent Watchmaking Most Popular. Emmanuel Esposito is the creator of extraordinary art knives and the collaborator involved in the release of the new Urwerk UR-T8 Colibri just unveiled at Baselworld 2019. This unique piece that is sold accompanied by an art knife by Esposito is a very elaborate piece of horology with the most unique look. Esposito’s passion for knives started at an early age back home in Italy. He developed his distinctive and unique style over the years, using high-tech materials like carbon fiber and metal alloys along with traditional materials like gold and mother of pearl. When URWERK approached him with an offer to work together, and showed him the UR-T8, he said yes unhesitatingly and decided to create a one-off matching knife for the watch. SIHH 2019: Urwerk UR-105 CT Maverick. Live Pictures & Pricing. After the huge success of the UR-105 CT Streamliner and the UR-105 CT Kryptonite comes a new iteration of this iconic model this time with a bronze and titanium case construction under the name CT Maverick. A watch that could very well be shaped after the helmet of a Roman Centurion , the new Urwerk Maverick is a timepiece that would evolve acquiring the patina of the owner’s lifestyle. Constructed to withstand the daily abuse of its wearer, the UR-10 CT Maverick features Urwerk’s wandering satellite hours where the hours, minutes and seconds are indicated at the front thanks to the emblematic and instantly recognizable signature element of the brand for 18 years. Posted on January 24, 2019 by Editor & Publisher and filed under Urwerk, SIHH 2019, SIHH and tagged Urwerk UR-105 CT Maverick Urwerk SIHH SIHH 2019 Independent Brands Independents 2019 Wandering Hours Limited Edition Watches Most Popular. 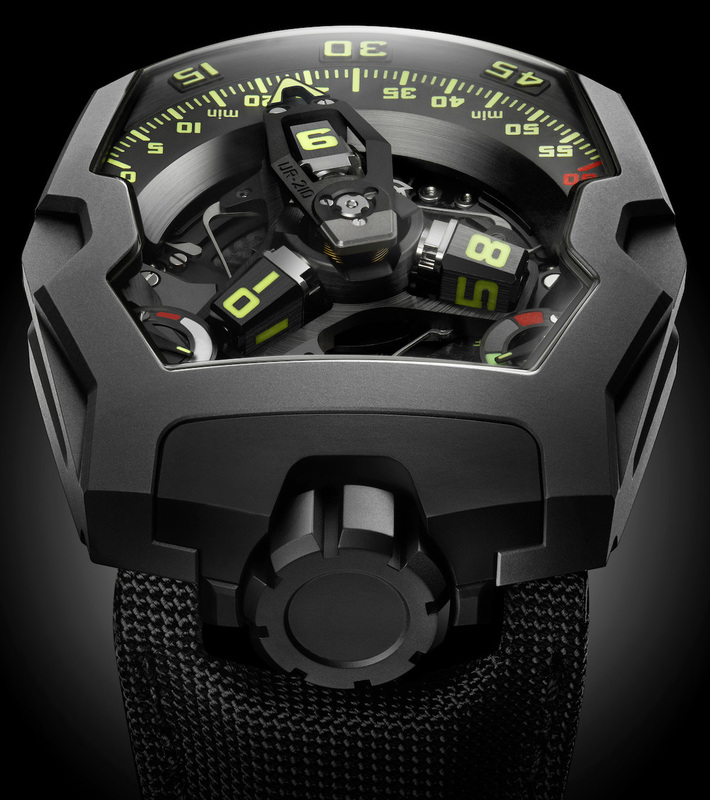 Insider: Urwerk UR-105 CT Kryptonite. Mint Green Accents that Make the Watch Light Up. o celebrate 20 years of their existence, Urwerk released the UR-105 CT Streamliner towards the end of 2017. Masters of horological disruption and the first independent brand to break the mold of watchmaking, Urwerk has continuously released irreverent and unique looking timepieces designed by Felix Baumgartner and Martin Frei. While the new UR-105 CT Kryptonite is not necessarily a totally new watch but a watch based off of the CT Streamliner with mint green accents and a gorgeous titanium case, this Baselworld 2018 release is even better than its predecessor. Posted on July 2, 2018 by Editor & Publisher and filed under Urwerk and tagged Urwerk Independent Brands Time Only Watches Urwerk UR-105 CT Kryptonite Urwerk UR-105 CT 2018 Most Popular. Baselworld 2018: Urwerk AMC Atomic Master Clock. Hands-on with the Watch that Pushes All Boundaries of Horology. In a groundbreaking move from independent watchmaker Urwerk comes the new Urwerk AMC —Atomic Master Clock. This combination between an incredible Urwerk mechanical timepiece and an Atomic Master Clock 'Monolith' console, is like something coming out of a science fiction movie or an episode of The Man from U.N.C.L.E. Taking its inspiration by the concept behind the Breguet Pendule Sympathique Clocks, the new Urwerk AMC timepiece is as innovative as it gets and living proof that when it comes to 'haute horlogerie', there are no boundaries. Posted on March 28, 2018 by Editor & Publisher and filed under Urwerk, Baselworld 2018, Baselworld and tagged Urwerk Baselworld Baselworld 2018 2018 Independent Brands Independents Urwerk AMC Urwerk AMC Atomic Master Clock Urwerk Atomic Master Clock Most Popular. Less than two weeks ago, we brought you the news about the new Urwerk UR-105 CT Streamliner released to celebrate the 20 years of this independent manufacture. Today, we bring you our hands-on review with this impressive timepiece that is as much of a watch as it is an object of desire. Designed by Felix Baumgartner and Martin Frei with New York in mind, we see more of a military look on this new watch than an urban concrete jungle feel to it. Posted on September 20, 2017 by Editor & Publisher and filed under Urwerk, Other Brands and tagged Urwerk UR-105 CT Streamliner Urwerk Independent Brands 2017 Time Only Watches Most Popular. News: Presenting the new Urwerk UR-105 CT Streamliner. In a New York State of Mind Celebrating 20 Years of the Brand. Urwerk is now 20 years old and to celebrate the occasion, the brand has released yet another spectacular timepiece in their own crazy impeccable way. It was 20 years ago that 22-year-old Felix Baumgartner set foot in New York, where Martin Frei had made his home. The new Urwerk UR-105 CT Streamliner was designed with New York in mind. Posted on September 7, 2017 by Editor & Publisher and filed under Urwerk, News and tagged Urwerk UR-105 CT Streamliner Urwerk Felix Baumgartner Martin Frei Independent Brands 2017. News: URWERK UR-105M Iron Knight and Dark Knight. Two Different Models Each in a 77-Piece Limited Edition. Today, URWERK released the new UR-105M, a timepiece that in their own words is inspired by the Middle Ages. An era when knights in shining armor would risk their lives for honor and glory, with only their faith and shield for protection. The UR-105M embodies their gallant valor in a titanium and steel arena, the satellite hours conquering time in an eternal jousting tournament. The new UR-105M is available in two different 77-piece limited editions with a case measuring 39.50mm x 53mm x 16.65mm. The UR-105M 'Iron Knight' is fitted with a sand-blasted titanium case with a stainless steel bezel with circular and vertical graining. Meanwhile, the UR-105M 'Dark Knight' comes with a titanium case and a bead-blasted AlTiN-treated steel bezel. 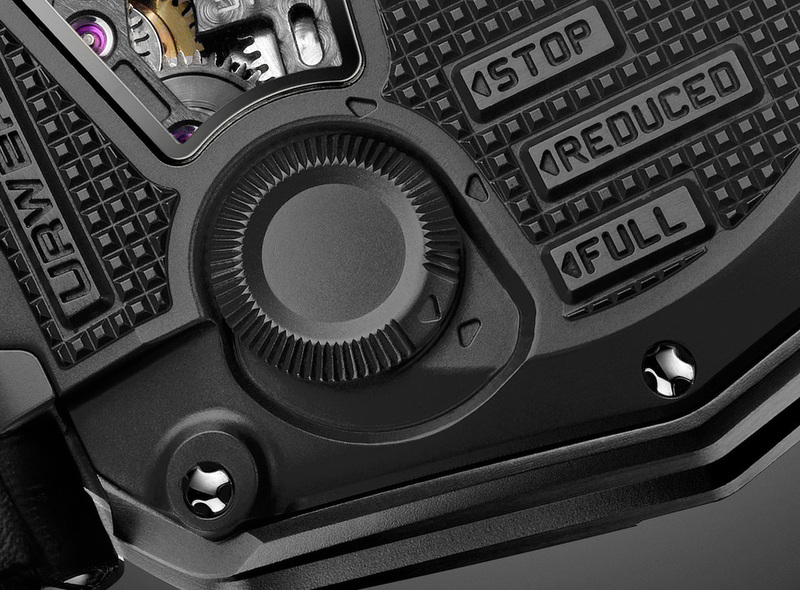 All of URWERK's iconic codes are present in the UR-105M. Satellite hours gliding slowly along the minute scale, darkened over-sized crown at 12 o’clock and a subtle technical feel. The UR-105M features an impressive titanium body reinforced by steel armor. At the heart of its time display four forged-aluminum satellites slowly orbit. Each of these satellites is visible during their 60-minute journey along the minute scale. A circular PEEK —PolyEtherEthercetone— canopy with openings enhances the current hour. Once the hour has elapsed, the satellite —guided by a Geneva cross— rotates and continues around its orbit for another three hours before returning to the center stage. Completing the indications, running seconds and power reserve are displayed laterally on the case band. A honeycomb seconds disk on the right side —underneath the minute dial— indicates the passing of 10 seconds. This indicator is synchronized to another seconds indication on the right side of the caseband. At the back of the UR-105M, URWERK’s signature ‘Control Board’ houses additional displays and functions: an ‘Oil Change’ indicator alerting when it is time for a service; 42-hour power reserve indicator; plus the fine-tuning screw allowing adjustment of the rate. The beating heart inside this new timepiece is the manual-wound URWERK calibre 5.01 with 38 jewels. The movement beats at a frequency of 28,800 vph and the watch is waterproof to a depth of 30 meters. The watch is fitted with a black alligator strap with pin buckle and we can only imagine the amazing wrist presence that it comes with. Sticker Price CHF 58,000 for the 'Iron Knight' and CHF 63,000 for the 'Dark Knight'. For more info on URWERK click here. Posted on April 23, 2014 by Editor & Publisher and filed under News, Urwerk and tagged URWERK UR-105M URWERK Iron Knight URWERK Dark Knight. News: Presenting the URWERK UR-210Y 'Black Hawk'. A Limited Edition of Only 75 Pieces. URWERK continues to wow the watch industry with their stunning complications and forward thinking design. After unveiling the fascinating EMC timepiece at the end of August of 2013, this time, URWERK has taken another big step unveiling the UR-210Y Black Hawk. A watch available in a limited edition of only 75 pieces in Titanium and AlTiN-treated steel. cylindrical flyback spring in the top center of the carrousel to the double-star gear underneath. Lastly, a double coaxial star-shaped cam regulates the retrograde mechanism through its gearing and its rotation defines the trajectory of the minute hand. When the minute hand reaches 60, the double star trips a (one of three) hockey-stick shaped spring under the mechanism, which liberates the minute to fly back to the next hour satellite at 0-minutes. Equipped with a winding efficiency indicator —a world's first— on the left top corner of the dial —11 o'clock position—, the display lets you see if you are active enough to replenish the watch movement with enough energy via its automatic winding rotor, or if the watch is just running on stored energy. The watch also lets you change the winding efficiency of its rotor so that it matches your daily rhythm, and I can even let you switch to manual winding mode if that suits the wearer better. This indicator will measure the winding efficiency over the last two hours. If the wearer's activity has been good enough to replenish the UR-210Y’s energy levels, the efficiency indicator will point emphatically to the green zone. If the wearer has not generated enough energy, the winding efficiency indicator will point to the red zone. Once the UR-210Y indicates an insufficient supply of energy, the wearer can then position the winding efficiency selector at the back of the watch to “Full” and then the rotor will then convert the slightest movement into stored energy. In this configuration, a turbine connected to the rotor provides smooth, unimpeded power. But if the wearer is more active, then that may provide more power than required and unnecessarily wear the mechanism. In that case, the wearer would position the winding efficiency selector to “Reduced” to engage the rotor damping system. An air turbine compressor mounted on ruby bearings spins and creates internal resistance —enough friction to slow down or dampen the automatic winding rotor. In the “Stop” mode, the automatic winding system is disabled completely and the UR-210Y runs off reserve power and may require manual winding. Because of its black color, the watch has earned the nickname “Black Hawk”. The massive case measuring 43.8 mm wide, 53.6 mm long and 17.8 mm thick, is made of high-tech titanium and AlTiN-treated steel, which increases its resistance to scratches and acids. The watch is also fitted with an oversized winding crown that takes the center stage as it is the norm on most of the URWERK creations. Additionally, for the first time in the history of an URWERK timepiece, the watch is fitted with a black nylon fabric strap. The caseback offers a limited view of the URWERK Caliber UR-7.10 fitted with 51 jewels, mono-metallic balance, spring flat balance, turbine equipped self-winding mechanism and which provides a power reserve of 39 hours when fully wound. On the back we also see the winding efficiency selector, as well as a small plate where the limited edition case number is engraved. The watch is waterproof to a depth of 30 meters. Sticker Price $175,000 USD. For more info URWERK click here. Posted on February 17, 2014 by Editor & Publisher and filed under News, Urwerk and tagged URWERK Caliber UR-7.10 URWERK UR-210Y. News: URWERK Presents the EMC. The First High-End Mechanical Watch with 'Artificial Intelligence'. 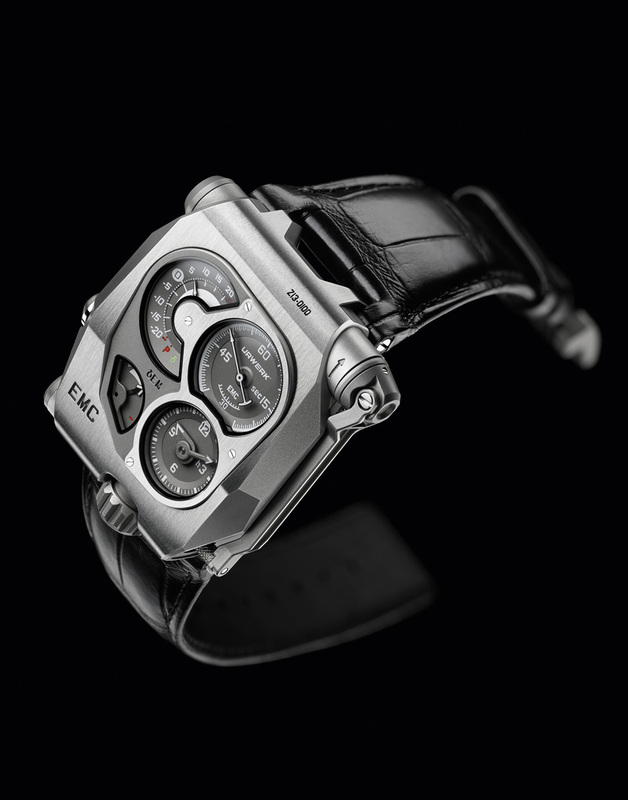 Today, August 28th, 2013 in Singapore, URWERK presented the EMC, the first high-end mechanical watch with 'artificial intelligence'. A precision timepiece should have at its base a movement that is accurate, reliable and long lasting. Such movement should meet specific criteria including accuracy in 5 positions between -4 seconds and +6 seconds over 24 hours. However, while it is one thing to regulate an accurate watch in the controlled world of a workshop, performance in the sometimes-extreme real world, i.e. on the wrist, can be very different. Changes in position and temperature, and shocks, can all adversely affect isochronism —timing regularity— of a wristwatch. The challenge with the EMC was in developing a mechanical watch that can be regulated by its owner to obtain the finest chronometric performance. EMC is the first precision mechanical watch that enables timing to be both easily monitored and easily adjusted by its owner. EMC features a deconstructed dial with four separate indications: A clockwise tour of the displays, from top left, presents the: on demand, precision indicator —instantaneous rate delta δ— ranging from -20 to + 20 seconds per day; seconds dial with counter-balanced seconds hand; hours and minutes; and 80-hour power reserve indicator. Turning EMC over reveals the fully in-house movement with the integrated circuit board —the EMC 'brain'—, the top of one of the two mainspring barrels near the crown and the top of the balance wheel and optical sensor on the winding handle side. At its heart, EMC has a triple objective: to show how external parameters —positional changes, temperature and pressure— influence the timing of the movement; to enable the wearer to adjust the timing; and to facilitate interactivity between the timepiece and its owner. EMC is inherently a precision mechanical watch with an in-house movement conceived, developed and crafted in the URWERK ateliers in Zurich and calibrated by URWERK in Geneva. The movement meets the most stringent quality control, with its chronometric performance tested in five positions during a 30-day cycle to ensure that it meets the highest standards for a precision watch. 1. A bespoke balance wheel made of ARCAP, an alloy long admired by URWERK for its non-magnetic and anti-corrosion properties. From the very first glance, the originality of this specially-developed balance is striking. Its perfectly linear morphology is the result of careful calculations to optimize data from the optical sensor, maximize aerodynamic efficiency and minimize loss of amplitude. 2. Power is provided by two large mainspring barrels in series, mounted vertically on a single shaft. These provide a long 80-hour power reserve, which is conducive to stable linear timing performance. 3. The timing adjustment screw is accessible on the back of the watch and allows the owner to make very fine adjustments to the balance rate regulator by changing the active length of the balance spring by turning a simple screw. 4. An optical sensor on the balance wheel capturing the precise rate of oscillation of the 4 hertz / 28,800 vph regulator, over a period of 3 seconds. This sensor consists of a transmitter and a receiver positioned either side of the balance, and is triggered manually by pressing a button on the left side of the case. 5. A 16,000,000-hertz electronic oscillator. This provides EMC’s reference timing rate. The performance of the balance of EMC —4hz— is compared against this lightning-fast oscillator to obtain the most accurate measurement possible. 6. Artificial intelligence —the computer. This computer determines the difference between the timing rate of the movement and that of the reference oscillator. Each microsecond difference between the two values is expressed as a gain or loss of a second per day of the timing rate. A variation of just 0.0000014 of a second per half-vibration translates as a variation of a second per day. 7. Manual-winding generator —the generator. EMC’s monitoring unit —the optical sensor and the computer— is powered by a micro-generator made by the Swiss company Maxon, which is well known for developing motors for NASA’s Mars rovers. To monitor and evaluate the mechanical movement, an 'electronic brain' was then needed. Olivier Evalet, a software developer who is passionate about software and computer engineering, has been instrumental in helping this bold project succeed: "The idea was to use precision optics, i.e. light, to measure the precision of a mechanical movement. The accuracy we managed to achieve is better than 10 microseconds. And we have created a reliable system that is designed to work over the long term. The power for EMC's electronic "brain" derives not from a simple battery but a super capacitor that even after 100,000 to 200,000 charge/discharge cycles loses very little performance. We also chose a high-frequency oscillator with an extremely long life – its instability is only 3 parts per million over a full year." Martin Frei —designer and co-founder of URWERK— had the considerable task of bringing all of EMC’s technical elements together in a visually-appealing and comfortably-wearing wristwatch. "At URWERK, the starting point of our creations is usually a sketch of the completed watch that embodies mine and Felix’s ideas before the micro-mechanics are fully developed. But with EMC, the technical features of the timepiece were already established and this made my task that little bit trickier. We miniaturized the EMC components to the extreme and this allowed me some leeway in terms of design. My approach was one of pragmatism – from incorporating the folding crank into the case band, to making the electrical energy storing capacitor part of the case. In terms of design, you can spot the influence of objects that are dear to me: the crank echoes that of old SLR cameras; and the design of the balance wheel is reminiscent of a vintage 1/4 inch tape reel". EMC system: Optical sensor controlled by an integrated circuit board: 16'000'000hz reference oscillator. For more info on URWERK click here. Posted on August 28, 2013 by Editor & Publisher and filed under News, Urwerk and tagged Urwerk EMC Maxon Urwerk Optical Sensor Bespoke Balance Wheel made of ARCAP Urwerk Electro Mechanical Control Watch Urwerk Mechanical Watch with Artificial Intelligence.